Sea Eagles Are Returning to Scotland and Preying on Sheep. Will Lasers Help? Efforts to bring back these formerly extinct birds of prey have been a success - but now farmers are fearing for their livestock's lives. A juvenile white-tailed sea eagle. This isn’t some “Star Wars”-type scenario. The lasers being considered wouldn’t harm the birds, or even be aimed directly at them, according to Scottish Natural Heritage (SNH), the government agency responsible for the country’s nature conservation. In theory, the lasers would be targeted at hillsides where sea eagles are known to prey on grazing sheep on Scotland’s west coast. The beams, it’s hoped, will frighten the eagles. Vicki Mowat, a representative of SNH, tells Modern Farmer that there has been some misreporting of the plan – this is currently just an idea; no tests involving lasers have been undertaken. “We haven’t even decided if we’ll do a trial of the laser scaring yet,” she says. According to Ross Lilley, SNH’s Sea Eagle Project Manager, the lasers are only one option being considered and that any trials that do take place will be carefully monitored “to make sure lasers are a safe and effective method before we proceed any further.” Other options are being considered, like using recorded sounds to frighten the birds. The white-tailed sea eagle has managed to make a dramatic comeback in the UK, especially in Scotland, where the birds were hunted into extinction by 1918. Sea eagles were reintroduced to the country in the 1970s. By 2015 (the most recent data available), 106 breeding pairs called Scotland home and conservationists believe their numbers will continue to climb. But with this growth has come complaints from sheep farmers about losing livestock to these massive birds of prey, which can have a wingspan of more than eight feet. 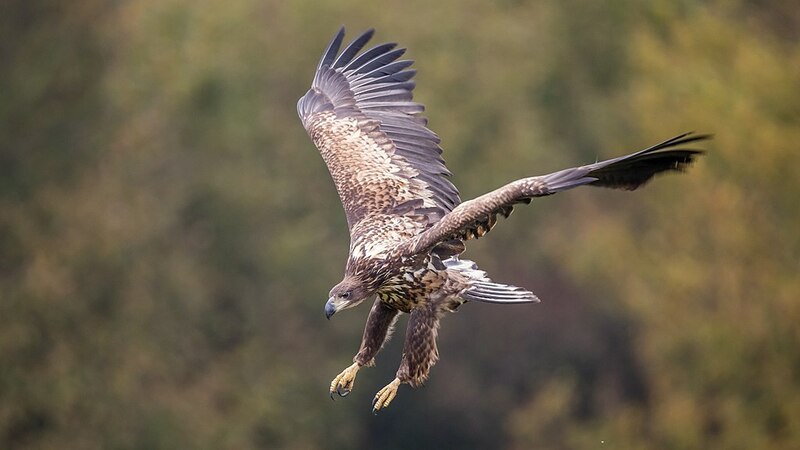 SNH has acknowledged the problem and has been working with farmers and others on the issue, but has said in the past that studies turned up no evidence of “widespread significant predation on live lambs” by sea eagles. In November, the agency allowed two trees that sea eagles had previously nested in near the town of Oban to be cut down in an attempt to discourage the birds from hunting in the area.